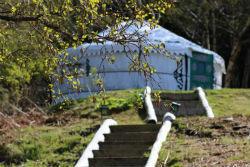 Join us at Kelburn Estate for a memorable glamping or camping experience. 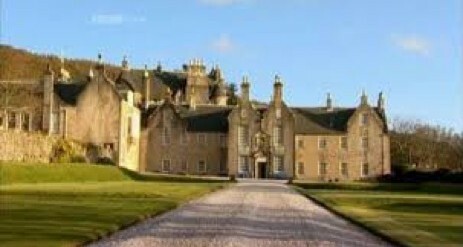 The estate features a number of interesting visitor attractions including a stunning 13th century castle and a family friendly country centre. 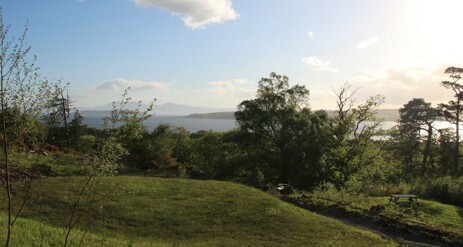 Kelburn Estate covers an area of over 3,500 acres, starting at the edge of the sea and rising to 1,300ft. One of Kelburn’s most outstanding features is its glen and with its waterfalls and deep gorges it is regarded as one of Scotland’s most beautiful woodlands. ***Please note our glamping yurts are available from 1st May – 27th August 2018. 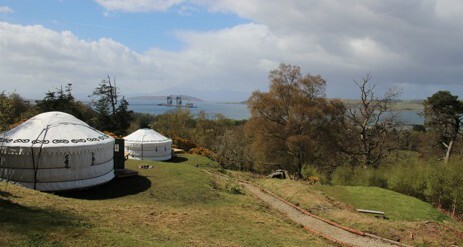 *** Our cosy yurts, each with a wood burning stove, are perched on a hillside with incredible views over the Firth of Clyde and Isle of Arran. This beautiful site is nestled beside a burn and is perfect for a romantic weekend escape or equally as good for tiring out young children! 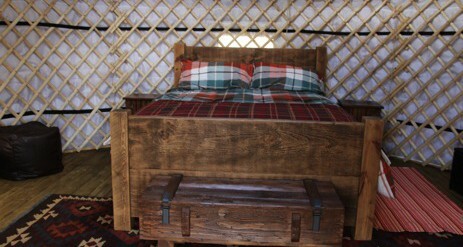 The glamping site features an eco-friendly design, which includes logs that were felled on the estate, solar powered lighting and a compostable loo. 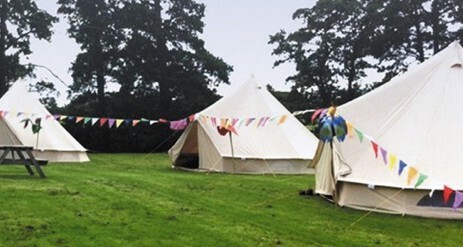 We have a set of incredibly spacious, 5 metre in diameter and comfortable Bell tents for hire between 1st May and 31st October, which we will set up for you before arrival. 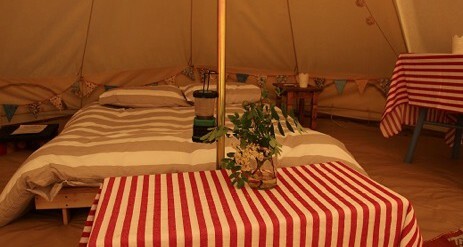 After bell tent hire, please delete the section on ‘Yurts’ as this has been included above. The rest after that is fine to remain the same. There is no electricity on site, but there is running water. 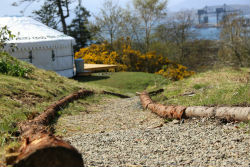 Kelburn has some great facilities for camping all year round! 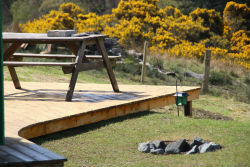 Our newly built bathrooms and hot showers, incredible views and ample camping space make it an ideal spot to stay. The Country Centre is a wealth of incredibly fun and educational activities for the whole family. Whatever the weather there’s always something to keep the kids occupied at Kelburn. Our most popular attraction is the Secret Forest, a complex of woodland paths and raised walkways with surprises at every turn. 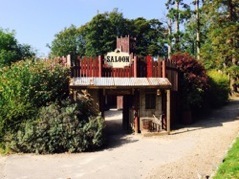 Then, there’s our famous Adventure Course, a challenging trail of high walkways and rope Swings, our fortress-style Wild West Saloon, with a 20ft high tower and our Playbarn, a softplay maze of tunnels, slides and dens. Playing by our spectacular waterfalls is always an irresistible attraction for children. The Waterfall Pool, set in a spectacular sandstone grotto is only 250 yards from the Centre. 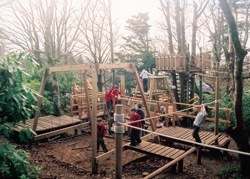 Test your agility and balance on our challenging trail of wooden walkways, stepping stones, rope swings and ladders. The adventure course is set in a woodland area that includes a high-wire crossing between two trees, 20ft apart and 15ft off the ground. Let the kids lose themselves in this exciting play area in a wooden fort with a raised walkway taking you around the outer battlements. It contains slides, a new sand pit, a scramble net and a 20ft tower that can be climbed from inside by a series of ladders. Visit our latest furry and feathered guests at Kelburn’s famous Pet’s Corner, recently converted into a Witch’s cottage! The kids can meet our different breeds of animals including rabbits, goats and owls, as well as less familiar species such as Alpacas, learning about how they live and what they eat. The Secret Forest is a complex of paths and raised walkways cut through a wild wood, in which you will discover a Secret Grotto, a crocodile pool, the Maze of the Green Man, a Castle with No Entrance, a Chinese Garden, a Gingerbread House, a secret passage leading out of the Woodman’s cottage, a 25ft high pagoda and 100 other surprises. The Cafe is open daily throughout the high season (April – October) and weekends in the winter months (November – March). 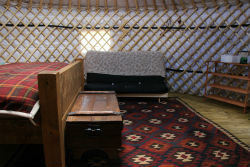 The Cafe is fully licensed cafe, serving delicious home-cooked food as well as hot drinks, snacks, ice-cream and cakes. Please note that our caravan park does not include electrical hookup or waste disposal. However, we have future plans for installing this and other features. The glamping site is located a 3 min walk up a moderately steep path, please keep this in mind as you would need to carry (with our assistance) your belongings up the path.